3-D printing is a form of additive manufacturing technology where a three dimensional object is created by successive layers of material. 3-D printers offer product developers the ability to print parts and assemblies made of several materials with different mechanical and physical properties in a single build process. Advanced 3-D printing technologies yield models that closely emulate the look, feel and functionality of product prototypes. 3-D printers have become financially accessible to small- and medium-sized business, thereby taking prototyping out of the heavy industry and into the office environment. 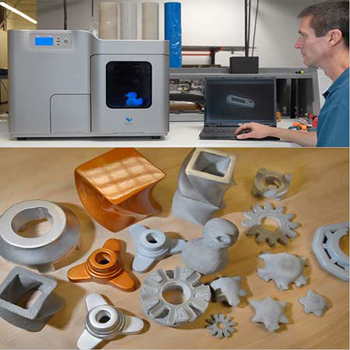 3-D printers offer tremendous potential for production applications as well. The technology finds use in the jewelry, footwear, industrial design, architecture, engineering and construction, automotive, aerospace, dental and medical industries. Historical perspective: By 2018, the 3-D printed gun emerged in America. The Washington Post reported that Defense Distributed founder Cody Wilson first published downloadable instructions to create an undetectable plastic handgun using a 3-D printer in 2013 because he wants to allow anyone to make as many guns as they want without government oversight. Such guns not only could be made at home by criminals or terrorists—they could be smuggled past metal detectors. The Obama administration forced Wilson to pull the files from his website, but the Trump administration reversed course in 2018. A federal judge filed an injunction just hours before Defense Distributed began uploading the 3-D gun plans but it was too late to completely stop it. The schematics were disseminated around the internet. Read the Los Angeles Times article below "These Printers Make 3-D Stuff" -- it includes images of Jay Leno holding prototypes of a hard-to-find car parts designed and printed in plastic using his 3-D printer. Be sure to also read the bio-ink definition below.